Added on February 18, 2015 by Matthew Sutton. The whole world is a stage. Well, okay, Shakespeare, but I believe that the reverse is also true — the stage is the whole world. At least, this statement is especially true when I am performing on a stage in a play. My whole world changes to the stage. The stage is all I can think about. On stage my awareness must become focused on every second of the performance, to try to make sure the scene as appealing to the audience as possible. But with my thoughts centered on myself, I, like any other actor, begin to question my capability as a performer. This problem of confidence became more apparent in a recent production of Talley's Folly in which I stared. In this play, there are only two actors throughout the entire show. There are no set changes and no breaks for the actors to go back stage for a breather. We, Vicki and I, were up there on stage for the whole performance that lasts for an hour and a half. I didn't mind all the lines involved, but what really killed me hard was the rehearsal. Vicki and I had to spill out our blood and energy to the director usually for up to four hours, every night, for three months. It felt like … oh … a rhinoceros was pounding his freshly polished horn right into my gut. Of course, he wouldn't take the horn out but he would ever so gently twist the horn to cause as much pain as rhinocerosly possible. Please understand there is no "intentional" connection between the rhinoceros and the director. Let's just say there are scars and leave it at that. Now back to this problem, I consider myself a rather confident person; I mean, I have been performing plays all through high school. I sing at concerts, I emcee at talent shows, and I sometimes cartwheel at circuses. I perform for people and I love it and need it. Being up there on a stage is very thrilling and even essential. However, with this play, Talley's Folly, I could not be the same high school actor I used to be. I had to change into this serious college actor. This was not my chance to be Tin Man again. As rehearsals progressed, I started saying, "Whoa! Shouldn't there be some more graduale transition before I dip my green-horned feet into the college acting pool.” Although I had great preparation in high school with an amazing director, this part of playing Matt Friedman, of course the part shares my name, was extremely more involved than any other part I had ever done. Let me be honest, this part and play was probably one of the toughest things I have ever done. I began to feel very unqualified for the position. Don't get me wrong I was giving it the most I had, but it hurt tremendously. One does not take on rhinos when you an eighteen-lanky-year-old. The few friends I had around campus encouraged me. Some would say, "You'll get it." But, this provided false comfort. Sure, I'll get it, but when and how well will I get it? At that time the pressure this part brought to me was extinguishing my life. I couldn't wait till the whole play would be over, then I'd have my life back. I kept on wishing that the future would be now. My whole world became engrossed in the play and even more so my complete inadequacy at completing this part with the hopes of getting a throw-a-way "good job" from the director. The play was no longer play, but work, hard work. Mind you, it wasn't hell, but the director did breathe fire through those rhinocerous nostrils. After a tiring rehearsal one night, I was lying on my bed trying to relax when the phone rang. I collected what energy I had and answered. The voice sounded vaguely familiar, but I couldn't tell. "Hi Matt! How is everything? This is your uncle Larry." LARRY! First I should explain. It’s not common for Larry to call me, its long-distance from New York City and, second, he is a busy, successful actor-musician-director on Broadway. "Wow! Larry, why did you call?" He said he had heard about this grand production of a play I'm in and wanted to wish me to break a leg (we were opening in two nights). I told him I needed as much leg-breaking as he could muster for me because I was having a difficult time with this part. For once, I believed my stress was understood. Of course, he never said, "Well, this is what you should do." He just told me about how he was doing and where he was going with his life. Larry has had a great amount of success with his move to New York City. He worked in the great Broadway productions of Cats, Les Miserables, and others. But now he found himself at a time to reevaluate what he wanted out of life. Unfortunately, he was facing a problem; he was getting caught in a downward spiral. He kept thinking that here he was a kid from a small town in Kansas trying to make it in New York City. What chance did he even have at becoming successful? But these he also started asking the other question, what chance would he have if he kept thinking he didn't have a chance. He said he was trying his best to avoid that self-doubting downward spiral that starts out innocent enough but soon enough becomes a real whirlpool of despair. He said he ought to be going, but one more time he wished me to break a leg. When the shock of him calling started to fad away, I began to realize what he had said. Oh my! I had started down this spiral of despair and I had never realized that I wasn’t giving myself the chance to shine. My problem wasn't me so much as it was my constant self-doubting evaluation of myself. Why did I need to do this? I love acting. I enjoy the thrill of the stage and the challenge of creating a character that will make the audience fall in love. Looking at myself was the thing that was tearing me apart. Looking to what good I could do will build me up. I went to practice the next day with this new found courage and finally felt like I was playing with the whole world in the play. I enjoyed every minute of the performances, not as Matt Sutton the actor, but as Matt Friedman, the lovelable romantic hoping for a kiss from Sally Talley. In my absence of courage I found despair; in the presence of courage I found joy. Thanks Larry. For more about Larry, see him on Broadway. Added on December 29, 2014 by Matthew Sutton. The visual arts can be analyzed in several ways. Here are 10 guiding elements that will help you analyze art in your writing. Added on December 22, 2014 by Matthew Sutton. Evil lurks when using these verbs in your writing. Avoid. Added on December 5, 2014 by Matthew Sutton. Added on November 22, 2014 by Matthew Sutton. Rules to follow for better writing. Never use a foreign phrase, scientific word, or jargon if you can think of an everyday English equivalent. Break any of these rules sooner than say anything outright barbarous. What image or idiom will make it clearer? Is this image fresh enough to have an effect? Could I put it more shortly? Can I say this more beautifully? Added on November 14, 2014 by Matthew Sutton. The desire for romanticism draws us to The Hobbit. I believe the attraction to it is because of its simplistic yet enthralling plot. Its hero, Bilbo shows tremendous courage even though he is humbly three feet tall. The Hobbit, as far as the plot is concerned, is simplistic, which is common in romantic literature. Other romantic literature of this nature would be Beowulf and of course King Arthur and his Knights of the Round Table. Here we see a simplistic meta-narrative of good versus evil. The simplicity captivates toward a clearly defined journey through goblin-filled paths, evil-possessed forests, and finally dragon-filled mountains where we will meet the breather of hellfire, the great Smaug. The plot orients toward the quest -- to be in the good to overcome the evil. In this tale, our Bilbo is presented with the decision to be for the Good before asking to be an adventurer against the Evil. He must be a problem-solver before he has even decided if he wants to solve problems. He must become the ring-bearer before he even wants a ring. Romantic literature is attractive because it's aspirational. Bilbo as a hero strikes us because he is a non-hero archetype. Unlike more common heroes like Beowulf (strength-conqueror) or Arthur (king-conqueror), we aspire to be Bilbo because of his heart. It is rightly large even though his stature is not. In Beowulf, we cling to the strongest man of the British Isles and in Arthur, we cling to the greatest leader to walk the hill fields of England. But Bilbo attracts through is non-heroic heroism. The dwarves are the brave, strong ones. Gandalf is the wise, all-knowing one. Yet, the entire journey's success is dependent upon the heroism of being clever, short, and lucky. But perhaps The Hobbit is not so different of a romance. Let's look at Beowulf. This book obviously has good battling evil. Our great and strong hero battles the evil terrorizing monster, Grendel. And Beowulf defeats Grendel, yet the surprise is that the defeat of Grendel's mother happens through a dual sacrifice of his paternal love for his countrymen and her motherly love for her monstrous son. In the Arthurian legends, the King rallies his knights in the exterior and interior battle against the temptations delivered by the quasi-evil Morgana. As in the other romances, our hero, King Arthur, defeats through sacrifice of his humble (almost un-royal) suffering by a deference toward other better knights. Nevertheless, let us go back to the unfortunate moment. Smaug, the great lizard of Middle Earth, is defeated by the right-hearted Bilbo. What cannot happen, happens. Bilbo cannot win, but Bilbo wins. He sacrifices everything and therefore wins everything. As we read these fairy tales, we feel a warming in our hearts as if we are falling in love again with the idea that sacrifice matters more than self. The greatness of romance literature is that it is the humanistic manifestation of our human attempt to transcend humanity. 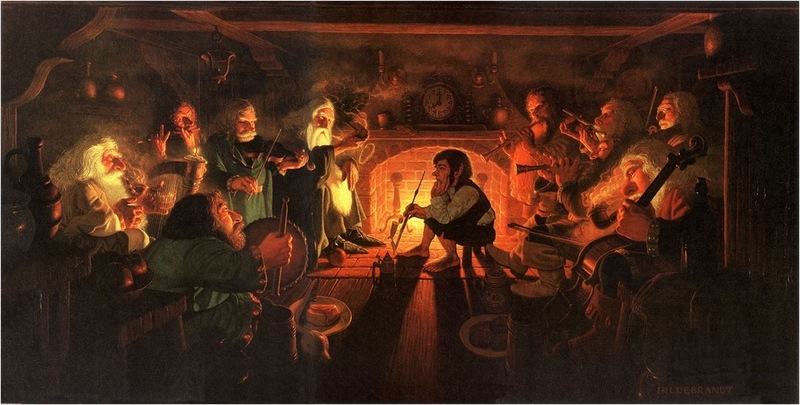 And so we should come to a judgment: The Hobbit guides us over a mystic land of Elves, Dwarves, Goblins, Shape-Changers, and Wizards to bring us a little more closer to romancing the heart toward the hobbit, the small one. And what's wrong with a little more romancing the hobbit? This is a slightly adapted essay from my high school days. Not bad. Added on October 21, 2014 by Matthew Sutton. My students should read this book, Elements of Style. They will be better for it. I know I am. Added on October 4, 2014 by Matthew Sutton. Does it move the piece forward? Stand back from the paper and look objectively at the major chunks. Do they all belong? Move in a little closer. Are there paragraphs or sentences the paper could live without? Lean over the pages still closer. Are there idle, cluttering phrases or words? Get out the magnifying glass. Could shorter words express the thought as clearly? Could some words be shortened? Is there a unity of subject and scope? Is there a unified tone and style? Are paragraphs and sentences to the point and unified? Are all words together that belong together? Are the relationships between sentences and ideas clear? Are all the parts in the right proportion? Are the important things anywhere but in the middle? Have I used effective repetition, variable length, and careful positioning? Have I always select the best word, best phrasing, and most effective diction? Do my sentences vary in length and form? Have I scrutinized my verbs? Is the use any of these [am, is, are, was, were, be being, been, will, shall, should, have, having, has had, may, might, must, can, could] a passive verb construction? Could I make any of these active or substitute a noun/preposition in a gerund? Have I used the verb that comes as close as possible to giving the reader an image of the action—without requiring an adverb to make it work? Have I limited modifiers instead of choosing the right noun? Have I used nouns that come as close as possible to describing the subject (or object) without requiring one or more adjectives? Do the nouns paint images, or are they merely vague abstractions? Have I limited parenthetical explanations, modifiers, and clauses? Have I used to concrete details? Have I made my writing live by stimulating the reader’s several senses? Do I have mixed, confused, or dead metaphors? Have I avoided distracters like obscenities, sexisms, dialects, clichés, jargons, misspellings, and misuses? Am I enjoying my writing? Will others enjoy my writing?